When you want professional quality marijuana, or when you have a large grow operation, you need a CO2 generator setup. Using dry ice, fermentation, or mushroom boxes just isn’t enough. You can’t wait for global warming and rising carbon dioxide levels to save the day, either. Right now, CO2 levels are at about 400 parts per million. You may have seen weed growing blogs and magazines quoting it as 350 PPM, but that’s data from years ago. If you want to know the current statistic, check out this page. Levels go up or down by about 10 PPM depending on the time of year, but yes, climate change is real, people. When you grow cannabis, you can raise the amount of carbon dioxide in the air to nearly 1500 PPM and your weed will flourish. You’ll have up to 30% more buds at harvest time if you add CO2 to the air. Go over that amount, and it will suffocate and die. Quick note: before we move on, if you’re going to add carbon dioxide to your plants’ air, use ventilation. Move the air around in your grow space. 1 Generators, regulators, and controllers, oh my! 2 How much carbon dioxide do you need? 2.1 Why is a timer also important? Generators, regulators, and controllers, oh my! You can purchase an all-in-one ready-to-use CO2 generator, or you can buy parts separately and put together your own system. You’ll need a source of carbon dioxide and a way to control its release into your grow room or greenhouse. Some all-in-one systems burn propane or butane to release CO2. If you don’t want to add extra heat and humidity into your plants’ environment, you can use a tank of carbon dioxide plus a controller and regulator. The controller senses the amount of PPM in the environment. The regulator controls the release of CO2 from the tank. Check the CFH rating (cubic feet per hour) if you have a generator. Measure the size of your grow tent to get the cubic volume (length x width x height). 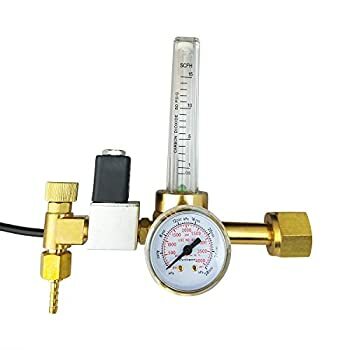 If you’re using a tank of CO2 like you’d buy for MIG welding, you can set the same amount of flow rate. Again, it’s smart to have a controller, and a timer, too. Plants only use carbon dioxide during the daytime, not at night. Why is a timer also important? Because breathing in too much CO2 isn’t good for humans. You don’t want to be hanging out in your grow room when your system is releasing the gas into the air. Unlike a generator that burns propane or other natural gas fuel, using a tank and regulator means you’ll be injecting gas into the air for a couple of minutes every couple of hours. You don’t need to let it run for long periods of time. It’s actually a pretty cheap solution. We’ll begin with the ones that have solenoid valves. The CO2 Grow Room Environment Regulator is a popular one for people who grow plants in aquariums, but it’s also ideal for growing pot. The flow meter adjusts between 0.5 and 15 cubic feet per hour and it has a pre-set regulator and a durable solenoid valve. It’s covered by a factory warranty. SPL touts their all-brass regulator because it’s precise and durable. They know their product’s good for growing weed because they point out that fact. 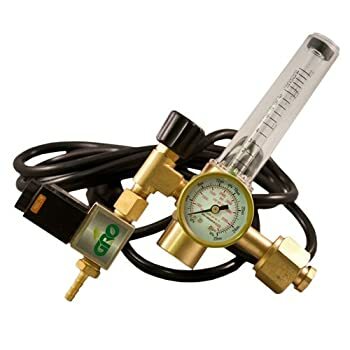 It comes with a flow gauge that can release between 0.5 and 15 CFH (same as the GRO1 described above). It’s rated for 0 to 4000 PSI. The 6-foot power cord needs to be connected to 110V electricity (sorry folks outside North America). It also comes with 10 feet of ¼-inch air hose so it connects directly to a 20 or 50-pound CO2 tank. 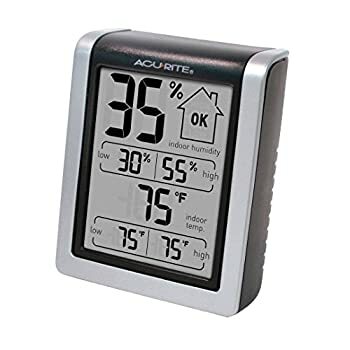 As Pro CO2 points out, this is NOT their aquarium regulator. This precision-made brass regulator is specifically designed for managing the flow of carbon dioxide for growing. It comes with a 10-foot long air hose and a power cord that’s made for a 110V outlet. It can handle up to 4000 PSI and release between 0.5 and 15 cubic feet per hour of gas. Yes, this is nearly the same thing as all the others. Up to 4000 PSI, between 0.5 and 15 standard cubic feet per hour…but it doesn’t come with an air hose. It does have a 4-year warranty and you will need 110V electricity. Really, it’s so nice to have something monitoring your CO2 levels. 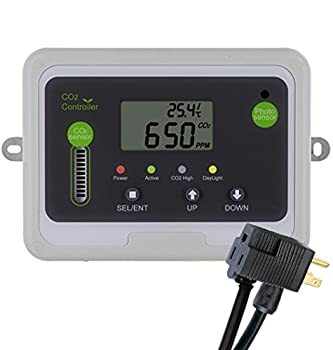 Use this CO2 Monitor to keep an eye on gas levels in your grow room. Mount it inside your setup and plug it into electricity and your regulator. It automatically shuts down your flow when it’s dark because it has a light sensor, or when levels reach your desired preference for PPM. In fact, you can be quite picky over CO2 PPM with this controller because it’s adjustable in 50 PPM increments from 100 to 9950. Autopilot’s APCG8LP is a powder-coated steel enclosure that burns propane or natural gas to add carbon dioxide to the air. 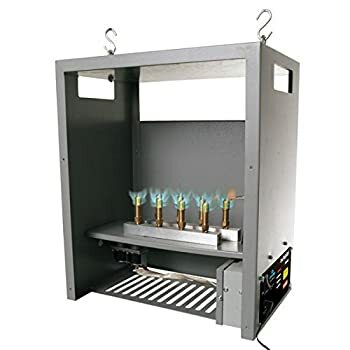 Keep in mind this is made for grow rooms larger than 14 by 14 feet. It could raise the temperature up to 10 degrees higher while it runs. It has a safety features that turns it off if it tips over. It’s smart to use a controller to make sure it runs only when it’s needed. It can put out up to 22 cubic feet per hour. If you don’t burn natural gas to make CO2 , you need another source. Why not have your canisters of carbon dioxide delivered right to you instead of hauling these heavy babies around in your car? This 20-pound tank of carbon dioxide will help you grow, and it can also carbonate your beverages. 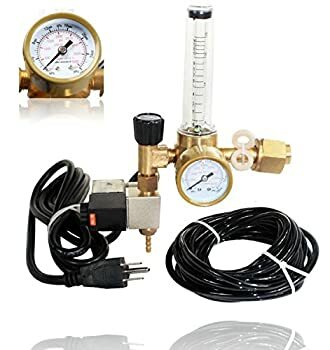 It keeps the gas at 1800 PSI, has a carrying handle, and a brass CGA 320 C)2 valve with a male thread ready for a regulator. It’s always a good idea to keep an eye on the temperature and humidity levels in your grow tent. This one’s battery-operated, easy to read, and wireless. This is an air hose that stays neatly coiled and out of your way. Nothing wrong with baby steps! 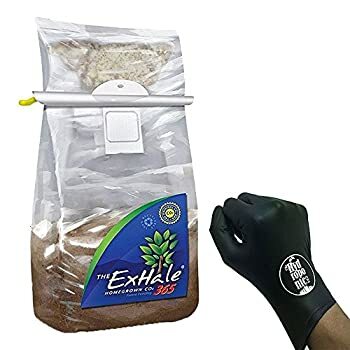 If you have a little grow room not more than 4 by 4 feet in size, you can still add CO2 to the air with this bag from ExHale. It lasts up to 6 months. Just hang it a little higher than your plants. 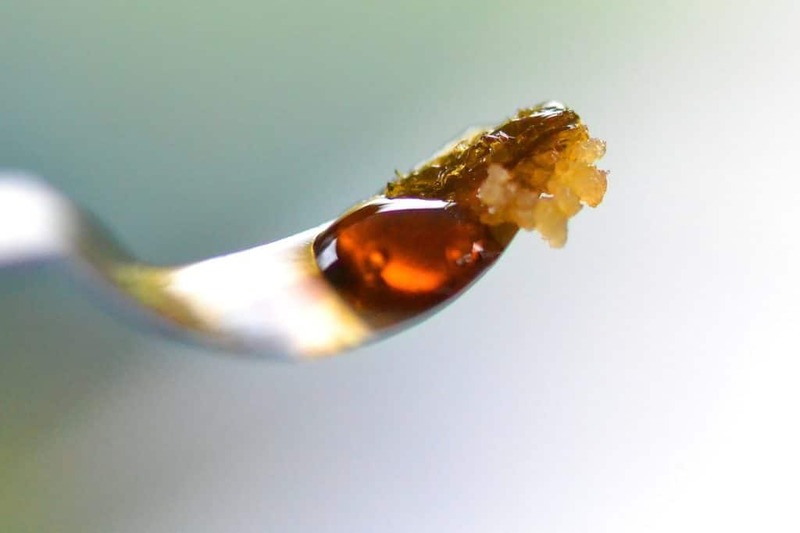 Using carbon dioxide to reap a larger harvest of cannabis is smart. It’s also not hard to do. Building your own setup with a tank, regulator, and controller is easy. Check back soon for more reviews of the best products for raising healthy weed. 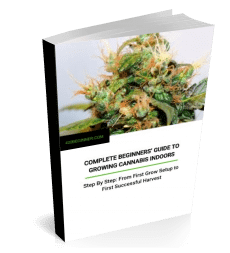 And if you still need to complete your ventilation setup, check out our round up of the best inline fans for growing marijuana. 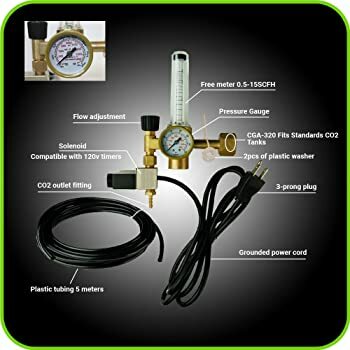 The CO2 Meter Controller on the page is great. Cheap, lots of good reviews. I bought one.